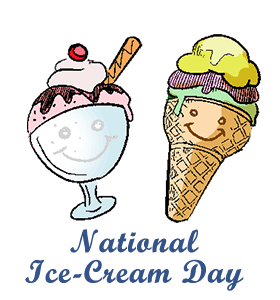 ﻿Ice Cream Day: Calendar, History, Tweets, Facts, Quotes & Activities. National Ice Cream Day is dedicated to appreciating ice cream. In 1984, Senator Walter Dee Huddleston of Kentucky initiated a joint resolution to declare July as the National Ice Cream Month and July 15 as National Ice Cream Day. On July 9, 1984, President Ronald Reagan proclaimed July 1984 as the National Ice Cream Month and July 15, 1984 as the National Ice Cream Day. This holiday is now celebrated on the third Sunday of July. According to the International Dairy Foods Association, the origins of ice cream date back to the second century B.C., when several prominent historical figures such as Alexander the Great, King Soloman and Nero Claudius Caesar enjoyed consuming iced beverages and snow. As the centuries passed, the snow and ice was refined into cream ice and eventually, in 1777, ice cream was first advertised in New York. However, ice cream was a rare delicacy for the elite until 1800s when ice houses were built. Since then, it has become a staple dessert for the American people. Per Guinness World Records, the tallest ice cream cone was made by Mirco Della Vecchia and Andrea Andriguetti in 2011. It was 9 ft 2.63 in (2.81 m) tall. During the summer of 1790, President George Washington spent $200 on ice cream. Meanwhile, according to Thomas Berry of Duke University, the price of 1 pound of coffee was $0.50 in 1788. 10% of milk in the US goes towards making ice cream. During World War II, ice cream was served to troops to boost morale while sanctions and rationing was in effect for the general public. When the war ended, rationing of ice cream was lifted and Americans celebrated victory with a cold, creamy treat. In fact, each American consumed more than 20 quarts of ice cream in 1946. In 2014, 872 million gallons of ice cream were produced in the United States. The average American annually consumes 22 pounds of ice cream. Enjoy ice cream with your family and friends. Get free or discounted ice cream. Most ice cream shops giveaway free ice cream or offer special discounts on National Ice Cream Day. Make President Thomas Jefferson's favorite vanilla ice cream. The recipe, believed to have been hand written by Jefferson is archived at the Library of Congress.